Vietnam is not a country known for walking. This country has been well known for its motorbikes. That isn't helpful for a traveler though. Thats where taking a Vietnam Taxi is gonna be important for you. We have all the information you need on how to call a taxi in Vietnam. How to Call a Taxi in Vietnam? Taking a Taxi has never been a budget-friendly option for traveling around. The situation is the same in Viet Nam. However, it turns out to be a decent choice in Vietnam where the condition of the public transportation system is troublesome even in major cities. If you prefer walking to taking a vehicle, you may want to think again. The hot and humid atmosphere combined with the hustle and bustle of Viet Nam will tire you down. If this is your first time visiting Viet Nam, there is a big chance that you have many questions about taxi services. You may not know how to appropriately hail a taxi and wonder if the cab you are trying to catch is licensed. You are afraid of being ripped off. You want to know if it’s possible to pay for your ride by credit/debit card. So, let us show you everything you need to know about calling a taxi in Viet Nam, especially in major cities. We only recommend Mai Linh Taxi and Vinasun Taxi for foreigners in Viet Nam. If you have any doubt about traditional taxi services in Viet Nam, it may be a good idea to use ride-hailing apps such as Grab or GoViet. How to Identify a Licensed Taxi? Unlike some other places around the world, for example in New York where taxis are either yellow or green, there are many brands operating cab services in Viet Nam. Hence, there are more than just one or two uniform colors for taxis. If the taxi you are ordering is not licensed, which means it’s illegal and unregulated by local laws, you can easily get ripped off. The authorities might not be able to help you in these scenarios. – Brand name, operating phone number, and logo of the taxi service provider on both sides of the car. – A price chart, a working meter connected to a receipt printer, and a taxi driver’s name card on prominent display inside of the vehicle. – An authorized taxi emblem stuck to the windshield. – A light box that says “TAXI” standing on top of the car. How to Know if a Taxi on the Street is Available? If there is no passenger in the taxi between 6 PM to 6 AM, the driver is obligated to turn the lightbox on top of his vehicle on. If the light inside a cab is on, it’s available. You can feel free to hail them. It might be frustrating to hail a taxi that looks “available” just to watch it pass by instead of stopping and picking you up. Perhaps the street is too crowded that the driver cannot turn the car towards you or they forgot to turn off the light. Please be patient and don’t get mad because it won’t happen regularly. How to Order a Taxi in Viet Nam? If you see an available licensed taxi on the street and want to hail it, feel free to do so since there is no specific spot for cab standing in Viet Nam. We know that hailing a taxi in the streets of Viet Nam doesn’t always bring about your desired result. Ordering one from their operators via phone might be a better option. If you are staying in a motel, hotel or resort, ask the receptionist to order a taxi if you need one. They definitely can help overcome any language barrier. The meter begins counting when the taxi picks you up. There is a fare called “open-door-fare”. It is set approximately from 8.000VND to 15.000VND depends on the service provider and model of the car. The further your distance is, the cheaper fare-per-kilometer you have to pay. For example, Vinasun’s open-door-fare for a 5-seated Toyota Vios is 11.000VND. Then, you are charged 14.500VND/km for the first 30 kilometers, and 11.600VND/km from the 31st kilometer and beyond. There is always a price chart inside every taxi showing detailed information and fare. There is no Uber or Lyft in Viet Nam. Instead, there are several similar ridesharing and ride service hailing networks such as Grab or GoViet for you to choose in your personal preference. They have foreseeable service fare as well as emergency reporting features thus the rides are more reasonable and safer. 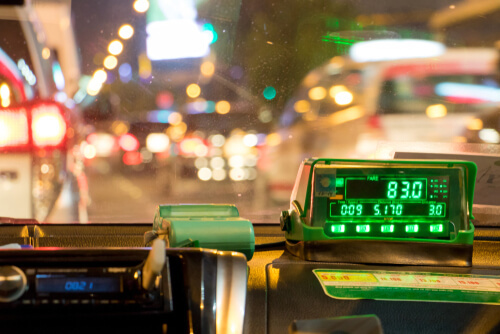 How can you Pay for a Cab Ride in Viet Nam? Drivers usually prefer cash. You can pay for your ride with credit/debit cards as well. Tipping is not a familiar manner in Viet Nam, but you can consider doing that if your trip is excellent. Drivers sometimes expect not to give back your change if it’s a small amount. If you feel irritated about it, tell them immediately. Before getting on any taxi, remember the number on the license plate, the taxi number glued on the windshield, or the driver’s name. If possible, take note of that information in case something dangerous happens. If you have a terrible ride or accidentally forget your belongings in the cab, providing that information to the operators can help solve your problems quickly. You can’t fully trust registered drivers since some of them might try to rip you off by going on a detour. You could always open up Google Maps to make sure your driver isn’t taking you the long way. Taking a Taxi is almost never going to be the most budget-friendly option. If budget isn’t your primary concern, taking a cab surely is easier and more comfortable than waiting for a bus or walking under the scorching sun. Also Taxi’s in Vietnam are most likely a lot cheaper than what you can find in other countries. We hope this article has helped you answer any questions you might have about how to call a taxi in Vietnam. Where to Buy a Sim Card in Ho Chi Minh City?